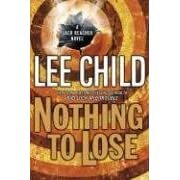 Action mystery author Lee Child can normally be relied upon to deliver very original and creative work, that is why it comes as such as surprise that his latest Jack Reacher novel, Nothing To Lose is such a disappointment. Not a disappointment in that Child still delivers crisp lean prose, bone-jarring action and thought-provoking mystery, but a disappointment in that Child has recycled plot lines from his earlier Reacher novels, specifically his dazzling award winning debut Killing Floor. Just like its forerunner, Nothing To Lose starts with Reacher as the wandering loner passing through a small town and being unfairly harassed by local law enforcement. Why even his confrontation with police in the opening pages of each book happens in almost identical places. A restaurant in Nothing To Lose; a diner in Killing Floor. And Reacher’s love interest each time is a female police officer who provides him with invaluable information and assistance with no regard to the upheaval it brings to their personal lives, with Reacher leaving them and returning to his nomadic existence at the conclusion of each book. Also similar is that both occur in a small company town which owes its livelihood to a corrupt corporation owned by a megalomaniac who will stop at nothing, including death and mayhem, to see his evil plans succeed. In Child’s newest, as in Killing Floor before it, Reacher is the fly in the ointment, or rather the very large wrench thrown into the works which derails the best laid plans with literally explosive results. Jack Reacher is one of the most original and refreshing heroes in recent memory. A hulking steamroller of a man who can fight his way out of danger with fists, feet or elbows as well as pierce the cloak of the most Byzantine mystery with the precision logic of a chess grandmaster, while possessing the sensitivity and modesty of a cloistered monk. He can be both the irresistible force wreaking havoc and vengeance on those who oppose him or violate his code of victimizing the weak, or the immovable object standing strong against overwhelming odds to see his attackers shatter into bits upon his mighty form. This is Child’s twelfth Jack Reacher novel so maybe that accounts for the repetition of story lines. For readers new to the series this presents no problem, and they will greatly enjoy Child’s intricate plotting, breathless action and especially their introduction to Reacher in all his Herculean glory. For readers who have read Child’s previous books detailing the adventures of Jack Reacher there will be a sense of deja vu which will leave them unsettled and unsatisfied.